Matronics Email Lists :: View topic - Alternator Lead Wiring Component? Posted: Sat Jan 26, 2019 12:46 pm Post subject: Alternator Lead Wiring Component? I'm trying to sort the wiring layout on my newly acquired plane. It has a TCM 60 alternator and Zeftronics 15100 regulator which has (I) (A) (S) (F) terminals. The (S) terminal is not being used. The alternator has a single Field terminal and a Bus terminal. There are two wires coming off the Bus terminal, one to the bus, and the other that goes through what looks like either a condensor or capacitor then to the (A) terminal on the regulator. 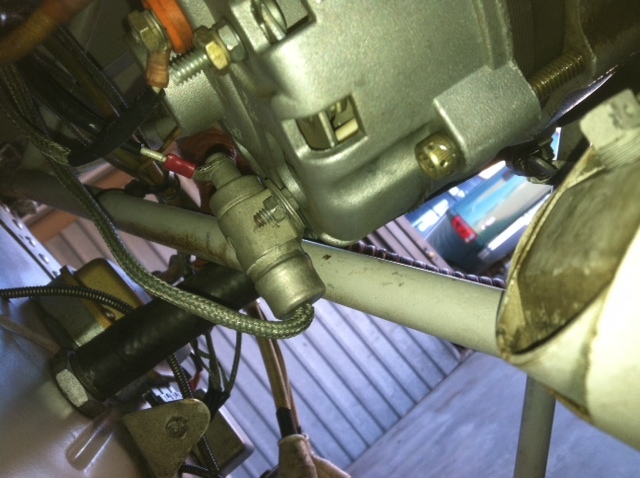 The regulator is powered via the cockpit switch, noise suppressor, then the (I) terminal. My question is what is the condensor/capacitor component, and what does it do? Posted: Mon Jan 28, 2019 8:44 am Post subject: Alternator Lead Wiring Component? Posted: Mon Jan 28, 2019 7:08 pm Post subject: Re: Alternator Lead Wiring Component? Thanks for the information. There is also a noise filter on the lead from the control switch to the (I) terminal on the regulator. They must not do any harm since the radio is clear. I'll just leave well enough alone.